Outdoor School is an amazing program that takes 11 and 12 year olds out into the woods for a week of hands-on, science education. And I mean hands on: wading through mud, dissecting a dead salmon, counting the bugs in a drop of water. Add in a teaching strategy heavy on collaboration, problem solving and community and you end up building leaders engaged and committed to this place. Now, thanks to the efforts of thousands of Oregonians–and the Legislature–Outdoor School will be funded statewide for the first time. Twenty-four million dollars ($24,000,000) is included in the 2018-19 budget adopted by the Legislature. Last November, I was part of an inspiring campaign to make it possible for every Oregon schoolkid to go to Outdoor School during their school career. The ballot measure we wrote passed with two thirds of the vote, winning in 34 of 36 Oregon counties. The measure authorized the Legislature to put $44 million a year into an Outdoor Education Fund, overseen by the State Extension Service. The source of money is the unallocated portion of lottery proceeds. Now, Legislatures are tough places that always seem to wrestle with too little money for too many needs and Oregon is no exception. The final budget bill passed last week included $24 million for this fund. This is a tremendous win for Oregon’s kids. While The Oregonian editorial board opines that the Legislature failed the voters by not fully funding this program(which they opposed, btw) and another measure endorsed by the voters last fall. Given the dire rhetoric from legislative leaders about budget cuts this year, I would argue that this isn’t too bad for a brand new, statewide program. As more students attend, and more schools ramp up their programs, we should see a building constituency for more funding next budget cycle. The State Extension Service has surveyed schools statewide to find out which is willing and ready to send their students to Outdoor School (many had cut Outdoor School years ago or are running shortened programs). They found need for about $31 million to fund planned programs, which means the Legislature funded about 80% of the need for the next two years. As wrap up to this determined grassroots effort, a number of statewide organizations are stepping up to monitor and advocate for Outdoor School. 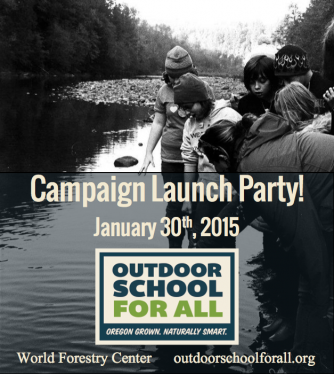 We’ve also published a case study, The Story of Outdoor School for All, as a history and a guide to others who might want to give kids in their state this transformational opportunity.